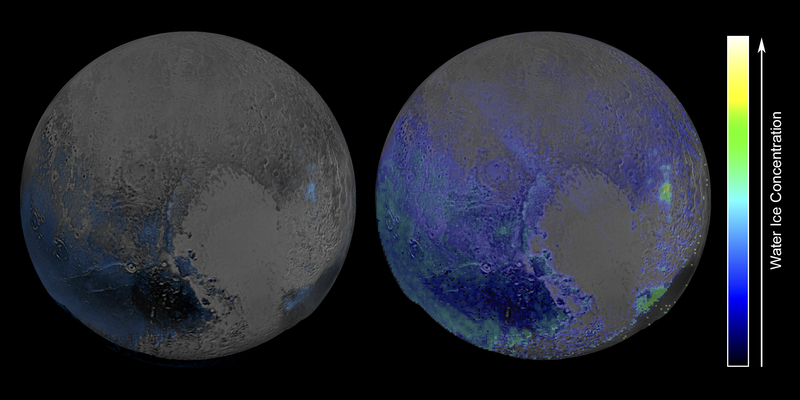 Data from NASA’s New Horizons spacecraft point to more prevalent water ice on Pluto’s surface than previously thought. Water ice is Pluto's crustal "bedrock,” the canvas on which its more volatile ices paint their seasonally changing patterns. Initial New Horizons maps of Pluto's water ice bedrock compared LEISA spectra with a pure water ice template spectrum, resulting in the map at left. A disadvantage of that technique is that water ice's spectral signature is easily masked by methane ice, so that map was only sensitive to areas that were especially rich in water ice and/or depleted in methane. The much more sensitive method used on the right involves modeling the contributions of Pluto's various ices all together. This method, too, has limitations in that it can only map ices included in the model, but the team is continually adding more data and improving the model. The new map shows exposed water ice to be considerably more widespread across Pluto's surface than was previously known — an important discovery. But despite its much greater sensitivity, the map still shows little or no water ice in the informally named places called Sputnik Planum (the left or western region of Pluto’s “heart”) and Lowell Regio (far north on the encounter hemisphere). This indicates that at least in these regions, Pluto's icy bedrock is well hidden beneath a thick blanket of other ices such as methane, nitrogen and carbon monoxide.